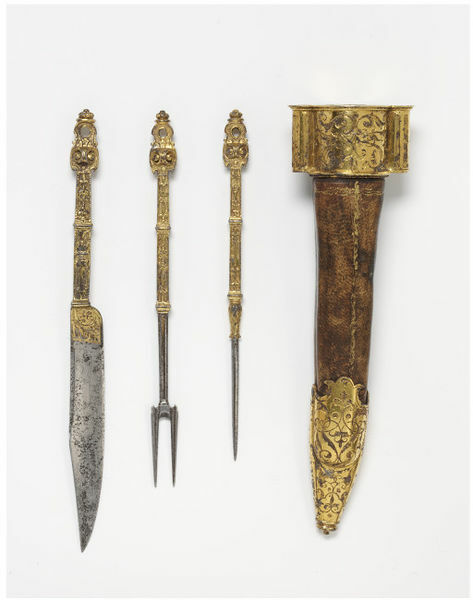 This French travelling set of cutlery, dating from the second half of the 16th century contains a knife with pointed blade for skewering meat, an early fork and a skewer. Owning fine cutlery in the 16th century was an outward sign of wealth, elegance and refinement. It was normal practice for everyone to carry their own cutlery, especially a knife, in a leather case. Cutlery remained individual and personalised. The knife was the main eating implement in Europe until the middle of the 17th century. The basic form of the table knife, a single-edged blade more or less pointed, with a handle, has remained virtually the same since Antiquity, although the details of construction, shape and decoration have varied. The survival rate also suggests that knives were not subjected to hard, repeated use. Although this knife is sharply pointed to enable it both to cut and skewer meat, fingers were used for much of the meal. The fork was introduced in Europe via Italy where it was used for eating delicacies like sweetmeats. Its use did not become widespread until the late 15th century when nobles and wealthy merchants were its main market. France, Switzerland, Germany, The Netherlands, Britain and Scandinavia gradually adopted it as cutomary during the 17th century. Until this time the fork was not considered essential for eating. Treatises warning people against touching food when one's fingers had already been in one's mouth may have contributed to a rise in standards of hygiene and the fork was the perfect tool to encourage this. 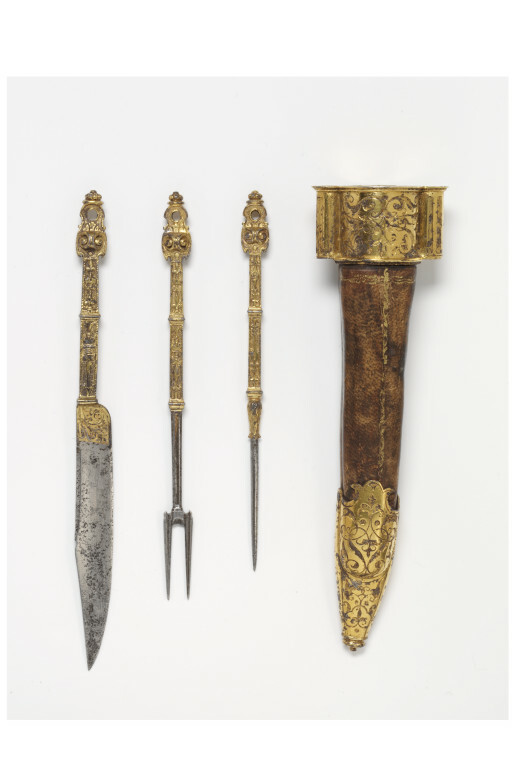 This cutlery set was originally catalogued as Venetian, 16th century. It came to the Museum in the Salting Bequest of 1910 (No. 1247), a major bequest including Chinese and Japanese ceramics and metalwork and European art. George Salting was born in Australia in 1836 where his father was a wealthy sugar producer. He was a very careful collector and was known to haggle endlessly over prices. By 1874, he began lending items to the V&A, then known as the South Kensington Museum, when his collection became too large for his residence in St James' Street. Salting died in 1909 and his collection was displayed the following year in its own gallery in the Museum. Prior to Salting's ownership the cutlery had also been in the collection of Baron Frederic Spitzer (1815-1890). Spitzer was an antiquarian and dealer in Paris, originally from Vienna, whose collection was sold in 1893. This cutlery set fetched 950 francs. The provenance of this cutlery, prior to Spitzer's ownership is not known. Historical significance: This cutlery set is notable for the fine arabesque (running leaf) ornament on its mounts. It is also rare to have a complete set. 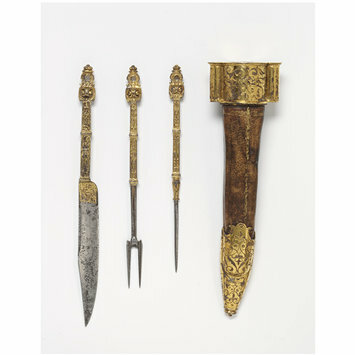 The fork in this set is an early example of the use of the fork for holding meat during dining although the pointed blade of the knife suggests the food was still conveyed to the mouth using the knife. Until this time the fork was not considered essential for eating. Treatises warning people against touching food when one's fingers had already been in one's mouth may have contributed to a rise in standards of hygene and the fork was the perfect tool to encourage this. The number of tines on a fork reflected its purpose. Two-tined forks were good for holding the food still while cutting. The more the tines the greater the variety of food that could be held and conveyed to the mouth. Three-tined forks were common by the end of the 17th century and a century later, four tines were the norm. Patterson, Angus, Fashion and Armour in Renaissance Europe: Proud Lookes and Brave Attire, V&A Publishing, London, 2009, ISBN 9781851775811, p. 95, ill.